I was recently informed by my very young 80-ish aunt that ever since Facebook came into being, I haven’t been blogging enough. NOTED! So what have I been up to lately? Plenty! Kid Number 2 graduated from HS. In our house, rather than throw a big graduation bash, we head off on a European adventure. Last year Kid #1 and I hit the streets of Paris. Kid #2 and I had a little bigger trip. And so, to the quilty-ish part of our tour. I adored strolling around, enjoying all of the wonky architecture along the canals. 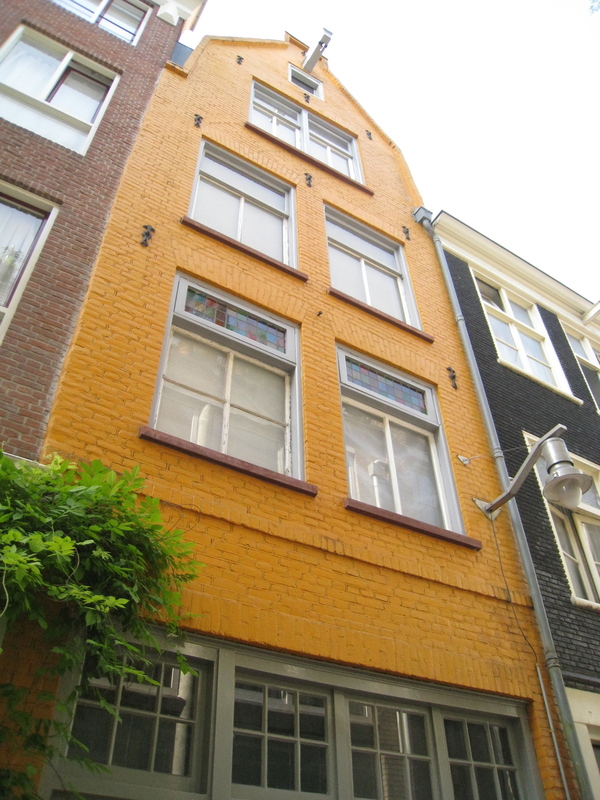 We found exactly one colorful house inside the Singelgracht (outermost canal in the older part of the city.) There may have been more, but I’m sure there must be historic restrictions. And this one was on a small alley. 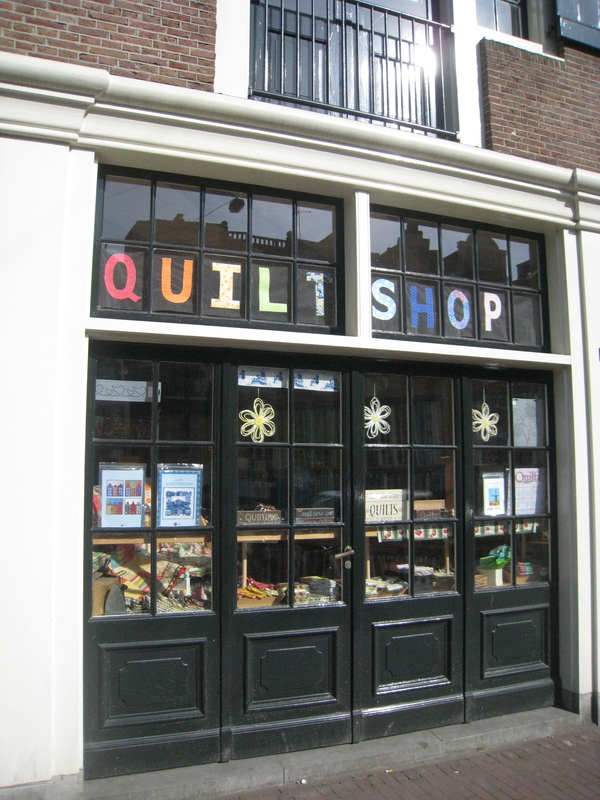 And right on the #5 Tram line, just a few steps away from Koninklijk Palace and Nieuwe Kerk . . . .
Birdblocks Quilt Shop! I passed by on the tram a few times on our way to and from our hotel before I was able to finally stop in during regular business hours. Merel (Mrs. Scissors!) was there with a smile–and some gorgeous colorful yardage! 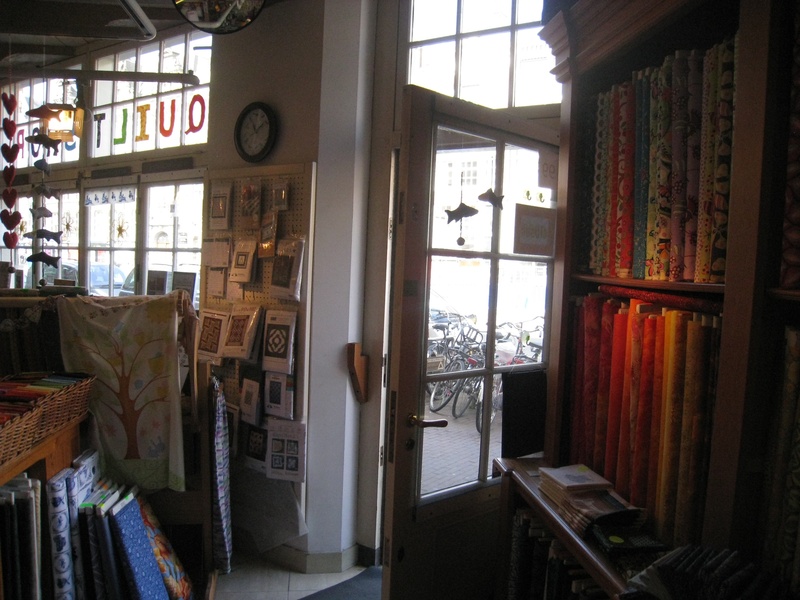 Next door, there is a sweet, upscale traditional Dutch fabric store. 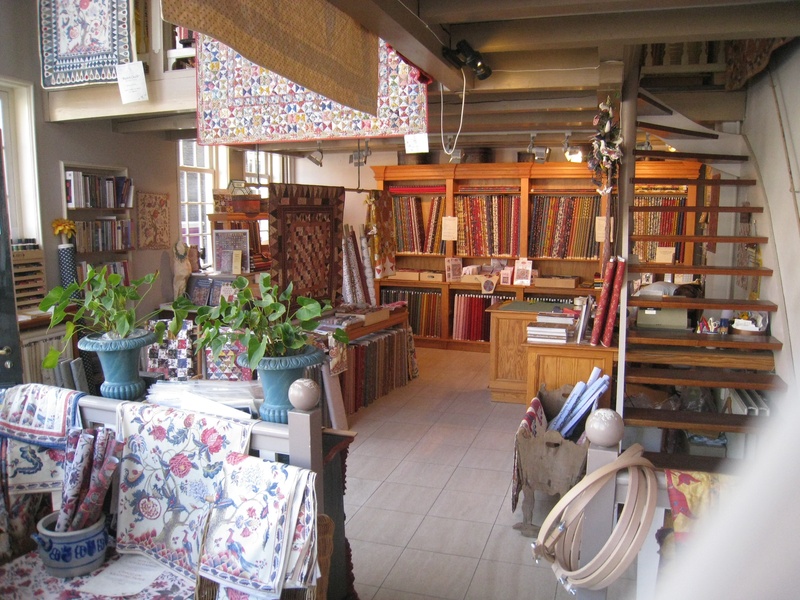 I tried to find some of the market fabric vendors that I read about in advance online, but didn’t have much luck. Nor did I have enough time to pursue them too heartily. Being avid cyclists, my son and I really enjoyed all of the bicycles–although we didn’t ride anywhere in the city. We’re saving that for our return trip. I do believe I will be going back to The Netherlands. Next Up: Deutschland! This entry was posted on June 20, 2011 at 6:29 pm and is filed under Uncategorized. You can follow any responses to this entry through the RSS 2.0 feed. You can leave a response, or trackback from your own site. 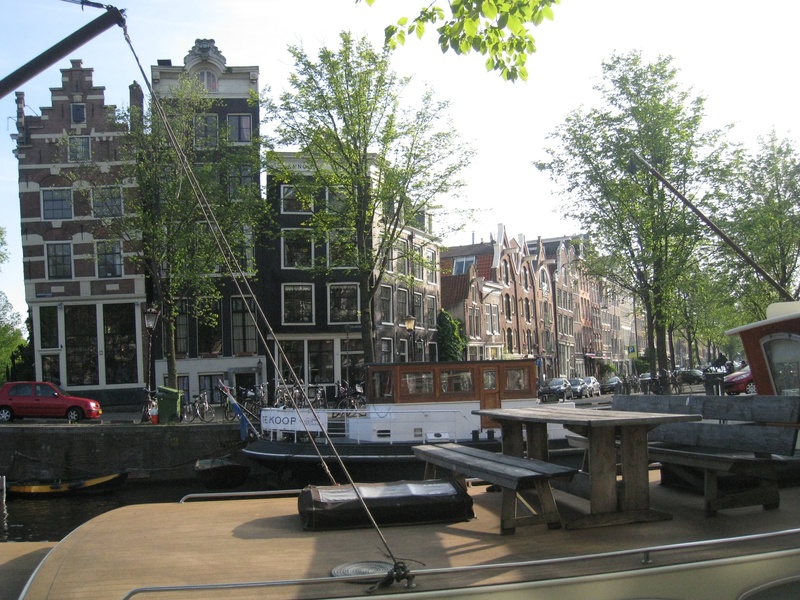 OH…after seeing these pic’s of Amsterdam–I wanna go there …NEAT!! THANKS so much for posting such wonderful pic’s…and what a NEAT IDEA to do for HS grads. Oh, what lovely pictures you took from our city! I recently found your blog because I was looking for pictures of Celosia Coxcomb. You had some great pictures of those flowers. I started reading your blog & really enjoyed each subject on different days.. 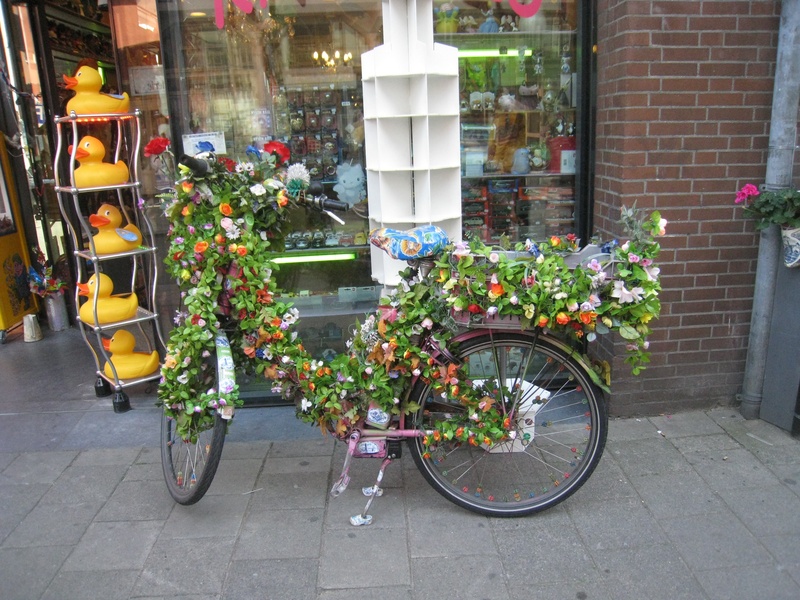 I really liked the picture of the flower covered bike in your 6-20-11 blog. Do you remember how they kept the flowers from falling off the frame of the bike? I would love to try it! Thank you again for sharing your thots & pics! I enjoyed them!! Hello! Thanks for the nice comment! I didn’t look closely at any of the bikes I saw in Amsterdam decorated like that (there were more than a few!) I will say that if I were to do it myself, I’d just use zip ties–they come in all sorts of colors now (available at places like Lowe’s, Wal-Mart and Home Depot).